According to his obituary, Ed Swearingen was born on September 12, 1925, on a farm outside of Lockhart, TX, to Ruby W. and Edward J. Swearing, Sr..
As a young boy he became deeply interested in airplanes, with Charles Lindbergh being his childhood hero. His mother related that he would roll the rug back in their farm house and use chalk on the floor to draw the fuselage of an airplane. Then he would lie on his side to see if he fit in the "plane." He sawed off the handle of a broom to simulate the cockpit stick, and learned to control the airplane. It was destiny that aviation would become his lifelong passion. He had become a very good mechanic and engineer working with farm equipment and other machinery. Combining the two interests, he built model airplanes, some of unusual design. After finishing the 8th grade, he went to work at Kelly Field as a Junior Mechanic's helper, and later at the Galveston Army Air Corps Field. After the war, he left the Civil Service work, took flying lessons to become a pilot, then returned to San Antonio to work in the electronic industry. In time, he met one of Texas' aviation pioneers, Dee Howard, and subsequently was hired by Howard. His work there in designing caught the attention of other aviation notables such as Bill Lear and Bill Piper's son, "Pug." He became an internationally known leader in the identification, design, development, and manufacturing of precedent-setting aircraft programs. He later founded his own company, Swearingen Aircraft, primarily as a consulting firm, and helped design many other companies' aircraft. He then began to design and manufacture his own planes. He designed 30 airplane programs, with the SJ30, a high-performing and affordable twin-engine jet being the 30th. Before his death he was working on his 31st airplane design. Awards along the way include the Aviation Safety Award from the FAA in 1962. 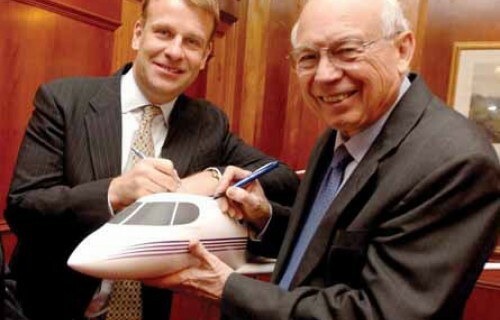 In 1974 he received the highest award of the National Business Aircraft Association. Later he was inducted into the Texas Aviation Hall of Fame and honored as a "Living Legend of Aviation."